I was thrilled when Jason Ziemba, drummer for the very talented band, Stillframe, was kind enough to grant AudioXposure an e-mail interview. If you haven’t had the opportunity to hear Stillframe’s truly unique style, you’re severely missing out. The raw emotion these guys put into their work shows through in every beat and every note, and when combined with the hypnotic depth of Brad Shanfelt’s absolutely beautiful voice, the experience is nothing short of addictive. Stillframe consists of Brad (vocals), Mark (guitar and vocals), Joe (bass and vocals), Dan (guitar), and Jason (drums). The guys hail from the West Chester and Reading areas, and play throughout the Philadelphia area. AX: From your website, I’m getting the impression you’ve been playing together for about a year. Is that right? Jason: The current lineup has been together for close to two years. Brad and Joe had recently gotten out of a band, and were looking to move on from that. They responded to an online ad I placed, and I joined in September of 2001. Mark joined shortly thereafter, and we solidified the lineup with Dan in September of 2002. AX: What would you say is Stillframe’s primary goal as a band? Are you guys playing to have fun and just enjoy yourselves, and if you make it, you make it? Or are you actively trying to make a career out of your music? Jason: Ideally, our goal is to present our upcoming 6-song CD to several industry contacts that we have made over the last few years, and attempt to get a recording contract. We’ve really gotten a lot of very positive feedback on the sound/look/direction of the band; something just feels right between all of us. We’re all very focused on making this work and taking it as far as we can. AX: Aside from the band’s career goals, what would you say is your “reason” for playing? Jason: Love, pure and simple. We love to perform original works. People can form their own assumptions about us. We’re not really trying to reach a specific audience or get a message out to people. I think the honesty and emotion of our music is what we’re all about; it’s sincere and genuine. That’s what we want people to see. AX: What do you think Stillframe has that sets it apart from other bands in the area? Jason: Extreme professionalism, and a refreshing style of original music. We’re not trying to be like anything on the radio. We use everything as an influence, but really try and write our own brand of melodic/textural rock. I don’t think you can classify us in any one genre. Also, we create a lot of energy on stage, we try to be very dynamic and visual. There’s a very high-energy performance level with us, and that’s the emotion coming out. Pure and simple. AX: What do you feel is the hardest part of trying to make it as a musician in this area, at this time? Jason: I think the hardest part has been getting people really interested and building a following. Cover bands are easy, ‘cause you already know the material. With original bands, we’re asking our audience to take a chance on something unfamiliar and embrace it. When you don’t do any covers, people have a tendency to back off. People don’t want to drive an hour away to see you in some bar in Philly on a Tuesday night. That takes dedication, and most people just won’t do it, unless you’re already signed and on the radio. AX: Do you think that you guys have anything that is a particular downfall compared to other groups? Jason: Our biggest hurdle is that we’re all professionally (gainfully) employed, and have our own homes, cars, bills and misc. headaches that life brings you as an adult. We don’t have unlimited time to practice and play, but we make the most of our practice sessions. A lot of times our schedules don’t jive, and we’ll miss out on a few practices over a period of time. Other than that, I believe we pretty much have it together. No drug/drinking/attitudes with this band. AX: As a group, who would you say are your greatest influences? Jason: Wow, we all draw from our own influences, both common and uncommon. I’d say we’re all into the Deftones, Chevelle, and Finger 11; but we’re individually influenced by stuff like Ravi Shankhar, Spiritualized, Rush, the Cure, Jane’s Addiction, Skid Row, the Used, Hum, and Muse just to name a few (well – more than a few!). AX: Who writes the majority of Stillframe’s music? Jason: Brad generally writes all the lyrics, which are primarily based on life lessons/experiences. Brad, Mark and Dan generally work on loose song structures for verse/chorus/bridge parts, then Joe and I will contribute to rhythm, and we’ll all refine and revise the song structure. At any time, any one of us could introduce a new part or phrase to a song that will really take it to the next level. AX: Which of your songs would you say is your strongest? Jason: I would say our most emotional song is “What It’s All About,” because it just bleeds with an emotional sincerity – it’s about making it as a band, and any musician can relate to it. But it does transcend beyond that. Anyone who is striving to break out into the world and make some sort of impact can relate. 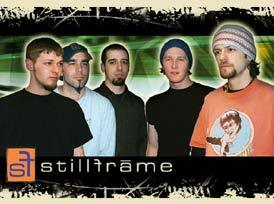 You can find out more about Stillframe, and hear some of their clips, at www.stillframemusic.com. Be sure to check these guys out. You won’t be disappointed! Goodwill was in the air this past month, and in the spirit of our focus on the February 18th Benefit Show Bands, I thought it was about time to do an update on the outstanding artists of Stillframe, one of the AX January featured bands. Stillframe worked to organize and co-sponsor (with Springfield Music and St. Mark’s Lutheran Church) another UNICEF Tsunami Benefit Show on February 19th. I had the chance to go check it out, and the show was definitely intense! Other bands featured that night included Anthrophobia, Devious Cure, Frozen in Time and Ashes of Decadence. This was my first opportunity to witness Stillframe’s live performance, and in good conscience I couldn’t keep it to myself, so hence this update! Stillframe definitely has a more mellow sound than most bands I hear. So, naturally, I expected that their live performance would be a little bit toned down from what I was used to seeing. During our past interview, I remembered Jason telling me that these guys had a high-energy performance. Then again, all bands say that, so I didn’t read too much into it. So, imagine my surprise when they start playing, and I’m seeing one of the most visually interesting shows of my life! Whether it was Jason pounding away on his set, Brad’s apparent gliding or floating all over the place, Dan’s almost musical “fits,” or Joe and Mark simply going with the flow of things, there was always something interesting going on. And that’s not even to mention how great they sounded! If you’ve heard their recordings (and since I told you to check them out two months ago, you should have by now! ), then you’ve heard their live show. Simple as that. They’re just as clear, crisp and unique as ever. These guys have a great sound, and obviously good hearts to put together shows for the sole purpose of helping others. Just another reason why you need to get out and see them. Be sure to check out our event calendar for more information on upcoming shows, read their January feature by clicking HERE if you haven’t already, and you can find out more information about these amazing guys at their website, www.stillframemusic.com. Keep your eyes out for new stuff from these boys. You wouldn’t wanna be left behind, now would you? Jenn Mattern is a professional writer and former music PR consultant who specialized in working with indie artists. She owns 3 Beat Media, the parent company of AudioXposure.